Is it worth paying $99 per year for Amazon Prime's free 2-day shipping on your orders? Depending on how much you order from Amazon, it may be. However, Prime is more than just 2-day shipping. The membership program offers a growing number of perks — and if you use them all, you're definitely getting a deal. Here five different categories of perks that come included with your Prime membership. Free 2-day shipping is probably the best-known Amazon Prime perk. Right now, members get free 2-day shipping whenever they buy eligible items (typically those sold directly by Amazon), though some inexpensive "add-on" items only ship with orders of $25 or more. Both products eligible for Prime shipping and add-on items are marked when you're shopping. If you don't need your new purchases that quickly, opt for no-rush shipping in exchange for a coupon. Amazon shuffles these coupons around, but frequently offers ones for digital items (like eBooks) or discounts on Prime Pantry. They're nice freebies to pick up if you'll use them — and don't need your purchases immediately. Expect no-rush shipping to take four to five business days. Prime members can get free release-date delivery on select pre-order items, like movies and video games. Alternatively, if you need your items even faster, you can get free 2-hour delivery with Prime Now. The service only offers a limited selection of items — which vary depending on your location — but covers the gamut of what you'd find in a typical big box store. 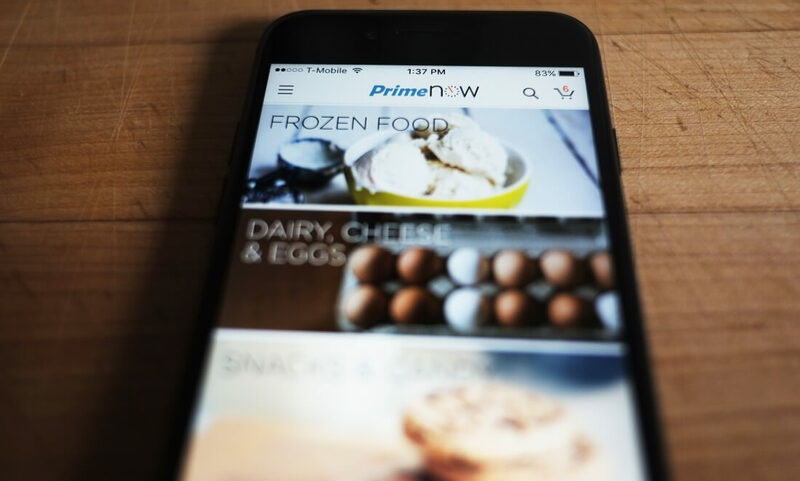 The highlight of Prime Now is perishables: These speedy deliveries mean you can order things like milk and eggs. Prime Now and same-day delivery (orders delivered by 9pm that evening) are only available in 29 metropolitan areas in the US. Eligible orders for Prime members of $35 or more can get same-day delivery for free; orders under $35 will cost $5.99 per order for Prime members. Non-Prime members in eligible areas can get same-day shipping for $8.99 per order, plus 99 cents per item. Prime members can also get free release-date delivery on select pre-order items, like movies and video games. Release-date delivery items will arrive on your doorstep the day they're released, all without the hassle of going to a store to pick them up. If an item is eligible for release-date delivery, you'll have a special release-day shipping option when you go to check out. All of these delivery times are guaranteed by Amazon, and if Amazon misses a delivery window, you could get a free month of Prime added to your account. The biggest drawback, however, is that you have to ask for it. Want to stream audiobooks, games, TV shows, music, or movies? Amazon Prime has them all. Prime Video offers thousands of streaming titles, including original shows like Emmy-winner Transparent. Get more shows and movies by subscribing to premium channels such as Showtime and Starz through Amazon, typically at a discount from stand-alone subscription prices. For music, Prime Music offers more than a million songs and albums to stream or download. Prime members also get a selection of audiobooks and original audio programming — think podcasts — through Audible Channels. It's all ad-free, with no limit to how much subscribers can stream. And don't forget that Amazon originally started as an online bookstore; some great Prime perks hark back to those days. Kindle First gives readers a free eBook every month, pulled from a selection of new releases chosen by Amazon's editors. The new Prime Reading program offers an all-you-can-read eBook library that includes books, magazines, and comics. The available selection is limited, not rivaling Amazon's Kindle Unlimited eBook subscription service ($9.99 per month), but it's still a solid perk. If you're a Prime member and an owner of a Kindle eBook reader or Fire device, you can also borrow books through the Kindle Owners' Lending Library. Like with the rest of these reading perks, a limited selection of books is available. Unlike the rest, you can only read Lending Library books with an actual Kindle or Fire device — not through the multiplatform Kindle app. For gamers, there's the new Twitch Prime, which offers ad-free access to Twitch's game streaming service and lets fans keep up with e-sports and other game-related programming. Twitch Prime members also get a free channel subscription every month and access to exclusive game content, though what's available will vary. Then there's Prime Photos, which gives you a place to store and organize your photos. Since you can access it on the web or via an app for iOS and Android — and share it with five people — it's easy to coordinate a family's worth of photos. Chances are you don't think about hopping online to do your grocery shopping, but Amazon offers an increasing number of ways to get everything you need delivered to your door — including perishables and produce. However, the company's grocery offerings are only available in select areas. The easiest option for groceries is one we've already mentioned: Prime Now, which brings a wide range of items to you within two hours. Over 10,000 items are available, but the selection varies wildly based on location. Prime Now can also deliver takeout from your favorite restaurants, but like other options, this depends on your location. Prime Pantry can be useful for ordering bulky items — which Amazon usually won't offer or won't ship for free. This means you can have bottled water and soda delivered right to your doorstep instead of having to lug it there yourself. And since you can get free or discounted Prime Pantry shipping by opting for no-rush shipping at check-out, or by adding enough qualifying items to your Pantry box, the convenience may not even cost you. But other Pantry orders cost a $5.99 delivery fee. And paying extra fees is anathema to many Prime members. AmazonFresh is a straight-up grocery delivery service that's available to Prime members. Fresh will bring your entire shopping list to your door (same day if you order by 10 am, next day otherwise), leaving it in insulated containers on your doorstep if you're out. That's definitely a dream for anyone who doesn't like trekking to the grocery store, but the convenience comes with a hefty price tag: $14.99 per month, with free delivery for orders over $40. For that price, you may decide the trip to the store isn't a big deal. Even with Amazon's already-competitive pricing, Prime members get an edge. Members have access to Amazon's Prime Day sales, early access to Lightning Deals, 20% off preordered and newly released video games, and family discounts, like 20% off diapers. Prime-only coupons or discounts are also available. You don't know what you're going to get with a lot of these deals — plus, Prime Day and Lightning Deals aren't necessarily Amazon's best bargains — but this discount combo offers something for everyone. If you're unsure of the value of a Prime membership, consider splitting the cost with someone else. You can share your membership with one adult living in the same household, so it can be a bargain for roommates.